SQUEAKY SHINE | Pro Chem, Inc.
SQUEAKY SHINE is a unique dust-blocking, no wax formula for use directly on surfaces as well as on cloths and mitts. It cleans, dusts, polishes and shines in one simple step. Eliminates dust fly-aways and leaves a lasting shine. Leaves no silicone or waxy buildup. 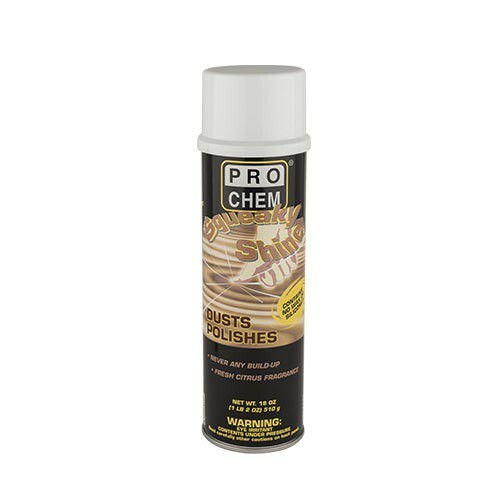 Reduces dust accumulation and preserves the beauty of the surface. Hold can 6-8 inches away from surface. Spray directly onto surface or onto dust cloth or mitt. Wipe surface immediately with a soft cloth. To enhance appearance, turn cloth to dry side and polish to a high shine. Note: Not intended for use on floors. Protect floors from overspray to prevent slippery conditions.